In my last post, I talked about the new EDI features in the August 2014 release of Microsoft Azure BizTalk Services (MABS), particularly in regards to the separation of agreements and bridges. In this article, I’m going to discuss how you actually create & invoke these new bridges – especially since the experience wasn’t quite as intuitive as I would have expected and the documentation is still a bit light. Prior to the August update, you used to create an agreement and this would automatically generate the send & receive bridges that hosted the agreement. Now that you create these artefacts independently, you can enjoy greater flexibility and reusability – but it also entails a few extra steps and requirements in order to establish it. Let’s walkthrough the process. You can’t really do anything without creating these. 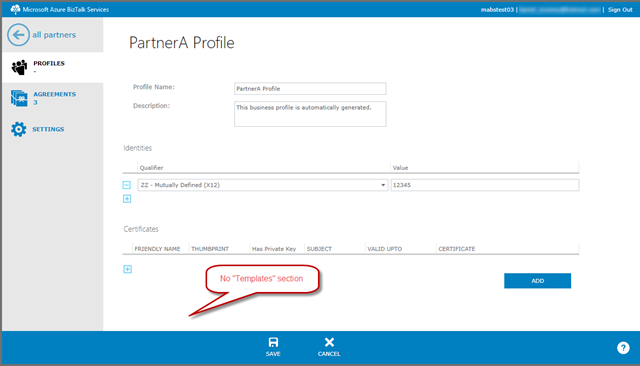 Nothing terribly significant has changed about this process in the latest update – except that you no longer have the option of creating an agreement template within a profile.